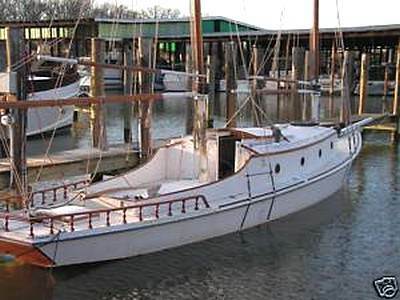 I purchased a 1949 wooden Sharpie sailboat 2 years ago that had been restored. The previous owner invested about $80,000 ten years ago. I spent $4000 to replace a rotten plank near the the hull in hopes place it in a slip in Annapolis, MD. Unfortunately, it took in water when launched about 8 months ago and now it is in dry storage at the marina. Should I try to fix the problem or cut my losses? So, what is the price you are asking ? This was just last year a friend was doing a job on the tied but I had seen this before yup theres an art to cotton and oakum drive it in two hard and you create gaps leeks the wrong amount of force and you may as well stat over check your through hole fittings. Grease your stuffing box only suggestions its all about the journey and the social life at the dock that is something you can't replace its like the dark angel lucus electrical when ford started making jags the owners had nothing to talk about that's wood boats and there was a comment of falling prices may be true on plastic boats but out there somewhere there are people that would bend over just to have that boat. My first big boat I made payments to the owner will I put the bling back into it. If you have lost interest have it appraised, donate it may surprize you on a five thousand donation you get a 30 thousand rebate if you are still doing the money thing. If not a full sheet of plastic under the hull allows for control of just how much water you want to deal with a slow cure the top seems may not see water unless you get out in a good sea. Picked a few sailors from the sea in my life thinking paint works but that's a myth. I had a much smaller wooden sailboat. After a complete recaulk with cotton and putty and a complete paint job .... it sank at anchor. After a week it floated after being pumped out. Thanks for including the photo, what lovely boat. I particularly love the taffrail. I built a wooden taffrail as part of the rebuild of my boat, so much nicer than the usual chrome and wire. To sell or to fix? Wow, difficult one but my first reaction is to say try to fix the problem. Difficult without actually seeing the boat or knowing more about her. However, as all that work has been done on her, I would have thought that she should be OK. When you launched her did you allow enough time for her to ?take up? and was there a lot of water getting in? Any wooden boat that has been out of the water will require time, when launched, for the timber to swell, thus making her watertight. Hardwoods planks will usually take longer than softwood. My present boat took at least a month in the water before the intake slowed to acceptable levels (her planking is mahogany) then another month before she became watertight. Something else to think about is that this isn?t the best time to be selling any boat, it is very much a buyers market and you could end up loosing out. On the other hand you are at the moment paying for storage on a boat that you aren?t using. By the way my boat was first registered in 1950, so she is nearly as old as yours.